CCC’s developmental math classes got the short end of the stick, especially when it came to professors. I can’t speak for all students, but I can speak to my experiences with the math 094 classes and my professors. I haven’t experienced all the professors, but the ones that I have are those that I will speak bout, and some comments from others students’ experiences. My first experience with Developmental Algebra 094 resulted in a failing final grade, thus failing the entire class. Struggling through my professors teaching methods, I managed to earn a C average for the class. I am a bad test taker and failed the final, which made me fail the whole course. Why wouldn’t the final be averaged into the class grade? I passed the class, and failed one test, so I automatically failed, which made the whole class a waste of time. With the professor that I had, I could never learn. Older aged teachers are very wise, yet very forgetful. Having an elderly professor in a developmental algebra class that consists of younger students, makes no sense. At one point I experienced him writing “10/2=8” on the board. Although a simple mistake, it was an obvious mistake, none the less. Not only did he write the wrong answers, he would re-do the problem on the board because he forgot and couldn’t figure it out. “Oh that’s not it,*erase.. do it again, *erase, *restart the problem.” When you asked him questions, he would never understand what you were asking. Once he understood the question he spent a half hour trying to explain it, but never really answered your question anyway. Students just stopped asking questions eventually. My second experience with Algebra 094 is nothing more than a lecture hall. The professor wrote problems on the board, solved them, and that was it. There was no classroom interaction. I was just supposed to catch on. There wasn’t any organization in these classrooms. If you fail, and retake it, like me, you start the class where I left off. The higher the chapters go, the more difficult the math becomes. If I failed the easy chapters in my first attempt at this class, what makes you think I’m going to pass the harder ones in my second attempt? I don’t understand why the class wouldn’t start over from the beginning. CCC has taken a new route to learning developmental algebra. Computer courses, and no more classrooms is the new thing. Once again I don’t understand the logic, because if I can’t learn this math with the professors, what makes them think I will be able to teach myself on the computer. Yes, I know there are tutorials to watch and materials there for you. That’s the same as having examples in my math book, which still doesn’t help. The courses are at your own pace, but students who learn at slow paces are surely going to get left behind. Advertised as the course that is impossible to fail and is taught at your own pace is deceiving. If you don’t finish all the tests by the time the course is over you have to take another session until you finish. Sounds to me like CCC has found a new way to get into their students pockets. Cumberland County College needs to find a solution to have students learn and pass these developmental 094 courses. A suggested solution is to hire effective algebra teachers. I believe that the professors should be evaluated and watched in a classroom on how well they teach the math material. Millions of Unidentified flying object (UFO) sightings are reported each year all across the world. There is an overwhelming amount of evidence each year to show that UFO’s and Extra-Terrestrials (ET’s) exist. But still governments try to disregard their very existence in light of this overwhelming evidence. There is much evidence to point to the existence of UFO’s. I have been interested in UFOs and ET’s for many years and in all my searches into government conspiracies and corruption many of the trails led me to the concept of alien intervention into mankind’s affairs since the beginning of creation. Recorded history sheds plenty of light on the existence of ET’s and UFOs. One of the first known recorded civilizations to have contact with ET’s, the Sumerians of ancient Mesopotamia, have inscribed the story of mankind’s creation on 22,000 clay tablets that explained who created mankind and why. Geologists in the 1850’s, in the city of Nineveh (Iraq), discovered these ancient tablets. Years later, famous author, Zecharia Sitchin, translated the tablets in the 1970’s and published his findings in volume of books called, “The Earth Chronicles.” The tablets depict that from a distant planet called Nibiru, a tenth planet, on a 3,600 year elliptical orbit in our solar system, extra-terrestrial travelers known as the Annunaki came to Earth and created mankind as a slave race to mine gold for their deteriorating atmosphere. With such a detailed depiction of the Annanuki, it’s hard to think that the ancient Sumerians didn’t believe in what they were writing. The word, Annanuki literally means “Those Who From Heaven To Earth Came.” These ancient travelers referred to as “Gods” by our ancient ancestors arrived approximately 450,000 years ago. An ancient traveler from Nibiru known as Anu came to Earth seeking refuge from his eroding planet, due to the lack of gold. Earth, being abundant in gold, was the primary target for Anu. Anu’s son, Enki, lands on Earth and establishes an Earth Station for mining gold. As more Annanuki arrive eventually warring between the Gods began, Anu created mankind to handle the chore of mining gold on the Earth by genetic manipulation of the Neanderthal man. Included in these tablets was an epic poem written on twelve tablets known as The Epic of Gilgamesh, which also depicts a flood myth tale similar to that of the Holy Bible’s tale of Noah and the Arc. The tablets read that the Gods caused a flood that destroyed the Earth. They were angry with mankind so they brought about a flood. A man called Utnapishtim was warned by the God, Ea, and was instructed to save the “seed of all living things” by building an enormous boat. After the completion of the boat, the Gods brought about the rains that made the waters rise. After the waters receded, the boat landed on a mountain. Then Utnapishtim set loose first a dove, a swallow, and then a raven that found land. Subsequently, the God, Ishtar, created a rainbow. He placed it in the sky to remind to the Gods and to mankind that there would be no more floods to the Earth. All other ancient cultures such as: Egyptians, Mayans, Indians, Chinese, and even Native Americans have depictions that refer to Gods coming down from the heavens and getting involved in mankind’s affairs. All this evidence gathered all over the world from our ancient ancestors leads me to believe that they saw something in the skies and some even made contact. Another culture that leads me to believe that aliens existed many years ago, as today, is the Nazca people. The Nazca people of Peru, 1,500 years ago depicted lines in on the surface of the Earth known today as the Nazca Lines. These huge lines drawn on the surface are in shapes of animals such as a condor, monkey, hummingbird, friendly-looking human (known as “the astronaut”), hands, another human figure, spider, and a tree. The largest figures are over 200 meters. The greatest mystery is not the necessarily the shapes themselves but rather the actual size. Why would the people of Nazca portray lines on the surface as big as 200 meters across, which could only be observed fully from the sky, when human beings first flight in the sky wasn’t until 1903, when the Wright Brothers took to the sky? Some of the amazing architecture of the ancient world is definitely evidence of alien intelligence at work. It is known that the Giza pyramids in Egypt align perfectly with Orion’s belt, in the constellation, Orion. The third star of the bottom of Orion’s Belt is where the Egyptian God Osiris is said to of come from. But strangely enough, half way across the world in Mexico, a city by the name of Teotihuacan also has three main pyramids that also align with Orion’s Belt. Some have speculated that the reason for the alignment is a way for the Aliens to map their location so humanity will always know where the creators originated. Even scientists are able to shed light on the possible existence of extraterrestrial civilizations, which harbor intelligent life. Frank Drake devised the Drake Equation in 1961 in an attempt to estimate the potential number of extraterrestrial civilizations in the Milky Way with which we might come into contact. The scientific community generally accepts this equation. Drake’s solution to the equation estimates 10,000 communicative civilizations in our Galaxy. It’s well known that astronomers estimate that there are 200 billion to 400 billion stars contained within our Milky Way. The Hubble Space Telescope (HST) site estimates there are hundreds of billions of galaxies in the universe. A recent German super-computer simulation estimates that the number may be as high as 500 billion so with all those possibilities, it would be an awful waste of space to not have other intelligent life exist elsewhere in the universe. One thread of evidence that helps bring the possible existence of aliens to life is what is known to be called as “close encounters of the fourth kind” or alien abductions. Thousands of alien abductions are reported each year. Many of the abduction testimonies are documented by trained professionals. And most of the abductees claim the same or similar abduction experiences as abductees half way across the world. One of the world’s leading UFO abduction researchers, David M. Jacobs, Ph.D., is the director of the International Center for Abduction Research (ICAR). Jacobs has conducted over 750 hypnotic regressions with over 125 abductees. He says that the majority of alien abductions all happen in similar fashion: removal of clothes, an exam, a mind scan, egg and sperm harvesting, to women a fetal implant and extraction 9-11 weeks later, a viewing of incubatorium with fetuses in containers of liquid, physical interaction with human-alien hybrid baby where women are required to have skin-on-skin contact, human children are taken to play with the human-alien hybrids as equals. Adult hybrids also take on special roles for the aliens by performing their own abductions and some have even had on-going, long-term relations with abductees since they were children. The aliens also make the abductees stare at screens with scenes of hybrids and humans interacting together in life situations. Occasionally, the aliens even implant visions in the abductee’s mind of cataclysmic events or simply just routine scenes of simple things. There is obviously some sort of pattern to the alien’s intention which is to integrate these hybrids into humanity. With so many testimonies, one can surmise that all of these accounts can be an accurate representation of an alien abduction. Many theories to why these aliens are here ranging from enslaving mankind, to colonization-leading to inconspicuous assimilation into the human race or for invasion, experimentation, and any other theories to why aliens are here, definitely conclude that an alien phenomenon is stalking humanity and has been since our inception. And with all the overwhelming evidence included in recorded history, ancient architecture, scientific communities, military cover-ups and alien abductions, humanity will continue to see that the alien phenomenon exists and is here to stay. Assistant professor of nursing Mary Padden, RNC, APN-C, FN-CSA, has been recognized this semester in the health and science department. Padden has been a fulltime professor since 2003. 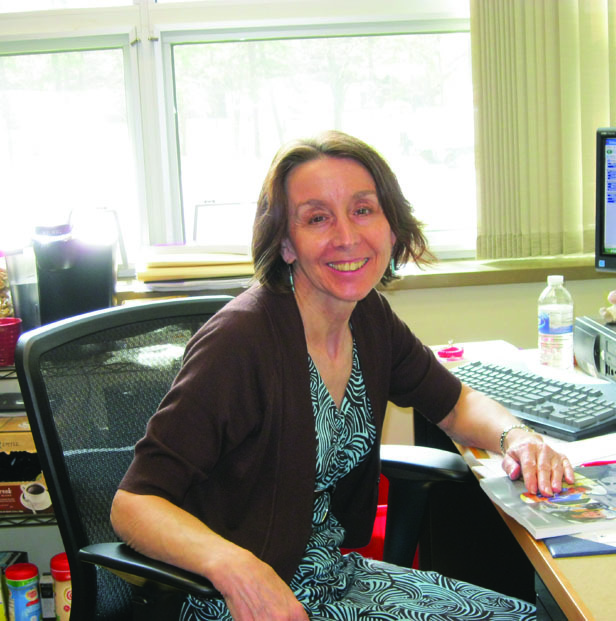 She began her career as a fulltime adjunct for Burlington, Gloucester and Salem County colleges. She is both nationally and New Jersey State accredited as a certified intensive care nurse. She is certified by the State of New Jersey as an advanced practice nurse. She is recognized by the state as an adult, sexual assault nurse examiner. Prof. Padden is a nationally recognized bereavement support specialist. Padden has been a nurse her entire working career. She was a neonatal intensive care clinical nurse specialist, childbirth educator and pediatrics maternal newborn nursing professional, although she always wanted to be a teacher because of her love of being influential. As a professor, Padden is very interactive and participative. Student-centered learning holds high standards in her teaching-learning agenda. “Students should come prepared and be able to have a discussion,” said Padden. “I want students to share their experiences,” she added. Prof. Padden believes in small group discussions and uses a clicker during class discussions. The clicker is a device used for students to answer questions through Power Point, like a quiz. The clicker keeps students’ answers discreet and makes the professor more aware of students’ levels of knowledge. The virtue that Padden hopes students take with them after having her class is to “provide someone with livelihood and rejoice in their work. You have to get up and look forward to going to work,” said Padden. As everyone knows times are hard right now, so why not try to save some extra cash? One easy way to do that is to flash your college ID. Before you can do that, there are some things you need to know about your student ID. First, your ID should be carried at all times while on the college premises. All students must have an identification card and it must be updated every semester. You can get your ID card in the Fitness Center, located in the Student Center. There is a replacement fee for lost or stolen ID cards and they’re required at all campus events and specialized venues such as the Computer Lab, Library, Fitness Center, and Gym. There are multiple ways to save money by being a college student both on and off campus. The campus cafeteria offers a wide variety of food for very reasonable prices. You can also save 25% on a bus pass with NJ Transit if you’re a full-time student as mentioned on page 1 in the “gas prices” article. Off campus, the SJH Fitness Connection gym, located on the corner of Sherman Avenue and Orchard Road accepts school IDs for discounts. Cocoa Bay tanning and spa, located on the corner of College and Delsea drives, gave discounts to students in the past and informed me that they may again in the future. In the same complex as Cocoa Bay, Subway offers a reward card in which you earn points towards free food. Even if you’re not sure if discounts are accepted, it never hurts to ask. Just by asking, you may be surprised what discounts you find. Many people may not know that you can save money on computers and laptops on the Apple website by going to a section that’s labeled, College Student and selecting Cumberland County College. The website will take you to a page similar to the Apple Store’s homepage, but computers and laptop are $50 to $100 cheaper than normal. Unfortunately, the more popular items, such as, iPods and iPads aren’t discounted. With increased prices on nearly everything from gas to food supplies, it is increasingly important to be economical any way you can. The more you save the less stress you will have to worry about things such as bills. Contrary to popular belief, money can buy happiness; at least while you’re a college student. Taking charge of one’s life, one choice at a time. The road of life is one of dedication, imagination and possibilities. Life is about making choices and it is up to you to follow your spirit and make the right decisions. Trust your instincts and follow your intuition and you will never be steered wrong. Walk into the light with your eyes wide open and enjoy the steps you have in front of you. Who knows what possibilities are in store? After all, life is what you make it. Why is it that when the most obvious things are in your view, you cannot see them at all, no matter how close they appear to be. The only real answer is to trust your instincts, they will never steer you in correctly. If the outcome isn’t something you are happy with, you must learn from it instead. Either way, the most important answer has been sought out. Life is about risks. Sometimes we may not make what seems to be the right decision, but in the grand scheme of things, it always works out for the best. There is always an answer to the unknown questions that unravel in our minds. If you reach inside yourself and trust your spiritual instincts, you will feel your way. Instincts are never wrong; they are the universe’s way of telling you, you are on the right path. Lack of self-discipline and devotion only draws loneliness, weariness and an unfaithful lack of compassion for the terms of endearment you want to embellish. The path where lonliness resides is one that will never fullfill you as a person. Curiosity may be the demise of your instincts, but can you trust that tou will gain happiness without knowing something that could have been. If you don’t indulge your natural sense of curiosity may never be truly happy? Without ever knowing, wouldn’t you always wonder ,what if? Some people live their whole lives thinking “coulda, shoulda, woulda” and wonder what may have happened if they only took the other path. Is it really fair to torture yourself this way or should you let go and trust your curiosity and deal with the consequences? May you have the courage to trust your intuition and know that the right answer will come to you regardless of the choices you make. 2012 catastrophic year or another Y2K? Do you remember in 1999, when there as a virus that threatened to send the world into darkness and a wide-spread panic? Some people were so terrified they spent their entire life’s savings on building bomb-shelters stocked with food, ammunition, and supplies. There was an enormous amount of propaganda surrounding the Y2K bug. What led mostly to the public’s expression of panic and fear was just plain lack of knowledge. Software companies were working their hardest to fix the problem and the news stands, obviously, picked up the story and ran with it in every which direction. The Y2K bug panic began in the early nineties, and became sort of a whisper down the lane; with each story having its own twist on a situation they knew barely anything about. We all know that the year 2000 has come and passed with no effects. No planes crashed, no bomb shelter’s required, and no need to fear as if your neighbor may get hungry and eat your dog. Just because planets align does that mean absolute catastrophe for 2012? Human beings were not on the earth the last time this occurred. So how can anyone predict what, “may” happen? The Mayan calendar ended in 2012; however, the Mayan’s just disappeared without a trace. Doesn’t that mean that eventually their calendar would have to end? The fact they even created a calendar that dates all the way up to 2012 is extraordinary. Unfortunately, even the brilliant people who work at NASA cannot say for sure what will happen. They stated in a report, on their website in 2010 urging people not to be afraid. Although, they do not know what affects this alignment will bring, they are assuring people that this is all just a hoax. NASA states that a magnetic reversal occurs every 400,000 years, so even they are not sure if any change will occur or even affect our way of life. NASA sums up its questionnaire by stating that there are no claims of any sort that scientifically conclude that the world will end in 2012. They also state that there are many fictional assertions being made that have people scared, and feeling threatened by a pending doomsday. Doomsday predictions tend to occur more frequently during rough times when people are struggling. Prices for natural oil and artificial goods are at a constant rise and strange weather has many concerned. Do these issues have anything to do with 2012 approaching, or is it because of the serious increase of holes in the earth’s ozone layer and the shifting of the Earth’s plates? A report in 2005 stated that the North Pole is moving towards Siberia at a rate of 25 miles a year and the shifting of plates is definitely accelerating. So, are we nearing an end, is 2012 another Y2K, or are we buying into a society so confused by conflicting media, internet gossip, and just simply not enough Intel to know better? 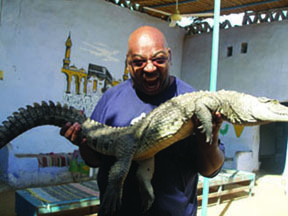 James Crowles handles a reptile. 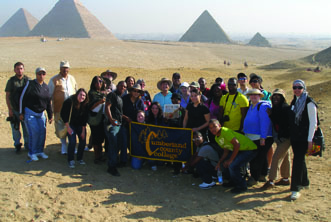 Cumberland County students and staff went on a 10-day tour of Egypt from Jan. 7 to 16 of 2010. 31 people, including community members of Cumberland County attended this life-changing excursion. The trip was headed and organized by staff members, Octava Nash, James Cowles, and Arthur Horn. Cruising the ancient and majestic Nile River was obviously a favorite of all who attended the trip. The group stopped at each port and had the opportunity to visit each village and interact with the many different villagers. Everlasting impressions from the townspeople followed them home. Students had endless opportunities for enlightenment and wonderment. They rode camels through the desert, and the non-claustrophobic students were able to crawl into the narrow tunnels that led into the pyramids. They also visited the Cairo Museum where they were granted a first-hand look at King Tut’s treasures and his mask. The Giza pyramid was a favorite of many because engineers still cannot replicate these magnificent structures is amazing to behold. Students and staff also learned much about King Ramses II, also known as Ramses the Great, whom was the most powerful and celebrated Pharaoh in all of Egypt. His statues and monuments are scattered across Egypt. Arthur Horn(who’s this? Need title) states, “ Ramses II was to the Egyptians, what George Washington is to the American people.” Appointed prince at the age of fourteen, Ramses led several military expeditions, re-asserting Egyptian control over Canaan. He ruled for sixty-six years and was regarded by future pharaohs as the “Great Ancestor”. The trip was and unforgettable and remarkable journey for all who were involved and has left everlasting impressions on all. Special Thanks to Octava Nash, James Cowles, and Arthur Horn for their heartfelt and informative insight and memories.